– Displays a list of the Top Organisations the firm is in contact with for the current month. 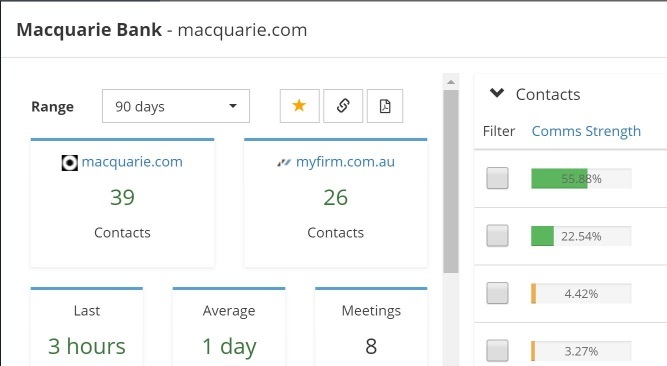 These can be added to Favourites directly and lists can be sorted to show the Top Organisations by ‘Sent’ email, ‘Received’ email, total ‘Emails’, number of ‘Employees’ with contact, the number of external ‘Contacts’ or the number of ‘Meetings’. – Displays a list of the Top Correspondents from the firm for the current month. This can be sorted to show the Top Correspondents by ‘Sent’ emails, ‘Received’ emails, total ‘Emails’, the number of external ‘Contacts’ or the number of external ‘Organisations’ they have communicated with. – ‘Contact by Department’ has been introduced as a chart to show which groups are having the most external communication across the firm. – The Organisation name is now presented in Client Sense, not just the domain when looking at a Client, Contact or Referrer Organisation. – It is now possible to show the fees / revenue for a client within Client Sense. 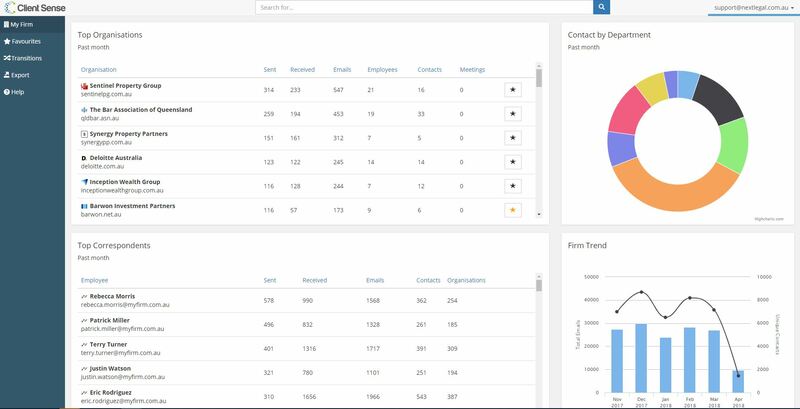 This allows BD and management teams to see the lead and lag indicators or communication as against revenue for a Client or Referrer. This requires the fees to be accessible from a separate Practice Management System and may require additional consulting services to setup. 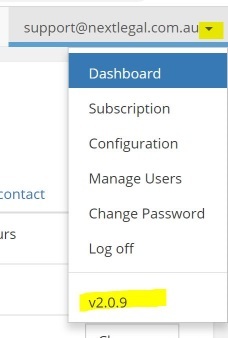 – Directly from the Client Sense interface, you can now see if a contact is subscribed to a MailChimp email list. Clicking the MailChimp icon will show which lists they are subscribed to and when they subscribed to each. – A LinkedIn icon now appears next to external contacts that allows you to immediately launch a search for the contacts name and company combined. We hope these new features will continue to provide value for you and your firm. An update on other exciting new features of Client Sense will be released in the coming months. You can confirm your current version by clicking the drop down icon near your username at the Top Right of the system (shown below). Please contact support here support@clientsense.com if you would like to be upgraded to the latest version.